Looking at these snapshots from last October (the last month where most of them were available) something just doesn’t add up in the CO2 as causal thesis. The “Global Warming” thesis is that the land is extra warm due to “downwelling IR” from “greenhouse gases” in the air. For this to work, the air has to be warm, and radiating. Radiating to excess, so that there is some to warm the ground. This heat has to ‘build up’. If it is leaving rapidly, there is no heat build up and there is no problem. Air molecules radiate in all directions. Some leaves ‘sideways’ out of the sphere of the atmosphere. Some goes down toward the ground. Some goes up to space and leaves. Less goes down than goes out (via the sideways and up). It ought to radiate uniformly in ALL directions from any spot in the air. That means that if there is ‘excess downwelling radiation’ there ought to also be more IR going UP as well. If this “downwelling radiation” is actually heating the surface, their ought to be a correlation between the “downwelling radiation” and the surface warming. If there isn’t, then where did the heat go? If the surface IS warmer, and the radiation at altitude is not, then where is the warm GHG that is providing that “downwelling radiation” that is supposedly making the surface warm? Basically, if “greenhouse gases” and “downwelling radiation” are causal of surface warming, their ought to be some correlation between them. As water vapor is a far stronger “greenhouse gas” than CO2, then variations in the water vapor ought to show as variations in surface temperatures. So what do the maps look like? Now the first of these is ‘anomaly’ and the second is actual C, while the third is ‘net’ actual Watts, so it’s a bit of a difference. Still, one ought to be able to compare the two and say some things. First off, if an area is anomalously cold, but the flux above it is constant vs a nearby area that is anomalously warm, then there is something wrong with the radiative theory. Some process other than radiation is driving the temperatures and is decoupled from radiation between them. While it ought to have a ‘full statistical treatment’, I’m also pretty sure that simply looking at the graph is illuminating. THE first thing I notice is that flux is more or less proportionately distributed with latitude, and reflecting a seasonal bias. There isn’t a whole lot of local variation at all. Net high positive areas are gaining heat. Net low negative areas are losing heat rapidly. Warming happens at the equator. Heat loss at the poles. How can we have very unequally distributed warming of the ground in nearby locations from “downwelling radiation” that is very smoothly and evenly distributed in that location? Radiation is far lower toward the poles (net negative, so losing energy). How can we have so much of the “warming” at high latitudes when they have so little “downwelling radiation” to work with? Next up, notice the scale. It has NET, with 1/2 of the scale being negative numbers, so net energy loss. How can you have high surface temperature anomalies in high latitude cold places that are NET dumping a couple of hundred Watts / Meter^2 ??! The flux radiation is low, so what “downwelling” is causing that warm anomaly? For that matter, if surface radiation from excess heat is so important to making the “runaway greenhouse” run, how can we have so much net outbound heat from the Sahara with so much anomaly cold? (It’s Flux is a green negative value, so we are losing heat from it and the “downwelling” isn’t stopping that). The actual temperatures in the Sahara are high, yet it is cooling, despite any “greenhouse gas” over it that ought to be causing “downwelling radiation”. Why is the largest and hottest anomaly area (Central Asia) under one of the areas with the most deficit in outgoing radiation? Remember that this is in W/m^2, so just saying that the area is actually cold doesn’t explain it as then you have to explain why Alaska and the Yukon are shown as cold, but with about the same net flux / energy loss. So if the actual flux isn’t causing the ‘warm anomaly’ what is? Is it just a data artifact? All in all, the energy loss to space seems to me to be almost completely decoupled from the surface temperature anomalies (with a minor allowance for the Sahara having a bit more coupling) and almost entirely a direct reflection of the incident solar energy flux. For the actual temperatures: How can Australia and South Africa be so absolutely hot, yet have not a ripple in the outgoing Net Flux? In fact, they look a bit LOWER on net flux than their surroundings. How can the Sahara be in actual degrees C hotter than Brazil, yet have Brazil showing much more net flux gain? WHERE is that added heat gain going, if not into temperatures? Here we have a map of what is supposed to be the strongest “greenhouse gas” in the atmosphere by far. It isn’t very well mixed (as it tends to cycle). So why are there not heat patterns matching this exceptional “greenhouse effect”? 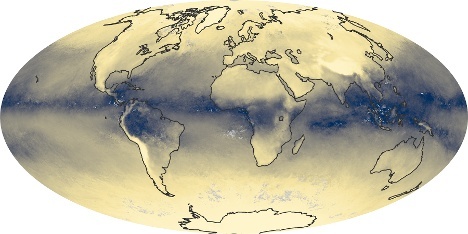 We have Brazil with much more water vapor, but cooler than the Sahara. It looks to me like water vapor creation removes heating and dry places go to higher temperatures. Notice that water vapor is roughly symmetrical about the equator, flux has seasonal offset. Water vapor is not causing the net flux to change via a greenhouse heating. 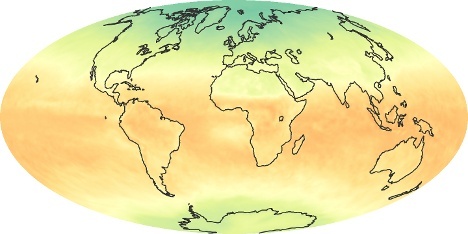 Water vapor is following ocean temperature profiles on a longer term scale. Water vapor is not cause, it is effect, and tightly coupled to ocean temperatures, not to ‘downwelling flux’. 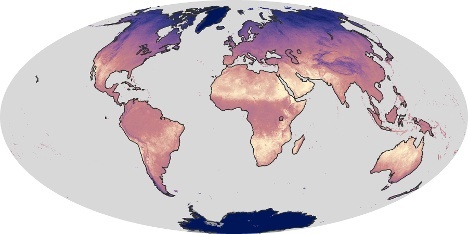 The anomaly “hot spots” are largely in the Northern Hemisphere (places like Canada, The Iberian Peninsula, Central Asia) where the “greenhouse effect” of water vapor is at its lowest. Where we have theoretically THE most “Greenhouse effect” in Brazil, Central Africa, Southeast Asia; we have cool temperature anomalies. Why can both Greenland and a spot that looks about the Gobi Desert in China have very low levels of this “greenhouse gas”, yet Greenland is dumping flux fast while Gobi (that is hopefully much warmer) is at about zero net? How can Australia range from fairly low levels of water vapor in the south to fairly high levels in the north, yet have a nearly uniform radiative flux and cold temperature anomalies? Frankly, if water vapor can have so little ( to no ) impact, how can an even less important component have an impact? CO2 is vastly lower on the total IR absorption level than water vapor as there is so much less of it. This graph is from September as they do not have October out yet. I may add October eventually, but for now this will do. Sea Surface anomalies do not change very fast (Enso and AMO and all that) so it’s representative of about how things would be. Sea Surface temperature anomalies seem to bear no relationship to the water vapor levels. There seems to be very little relationship with the Net Flux levels either. Furthermore, note that the RANGE of temp anomalies is only 10 C. FAR lower than for the land graph. Compare the range of the scales on the actual temperature graphs. The land gets very much colder, and more of the land is at the upper end of that scale compared to water. Why is the radiative flux not reflective of that higher range over land? 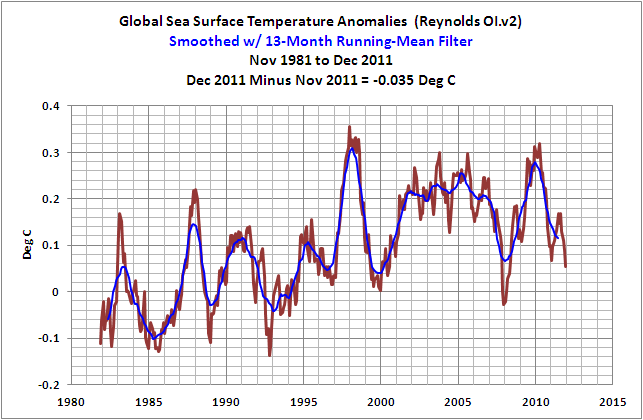 The ocean actual temperatures change much more slowly and do not track seasons nearly as much. Notice that the North vs South hemisphere water ‘range of cold’ is about the same while the same is NOT true over land. The land follows seasons, the water not so much. So WHY is the range of the outgoing radiation flux highly representative of that seasonal variation but NOT of the surface temperature distribution (or lack of change of it) in the oceans? If outgoing were related to surface temperatures, it ought to reflect that difference. It does not. IF the ocean is so much more stable and with such more limited swings of temps (and also water vapor pressure over it); why is the Net Radiative Flux not reflecting that fact? Net Flux is substantially smooth with latitude, not reflecting the land form (modulo the Sahara) and showing seasonal bias even over water that does not. 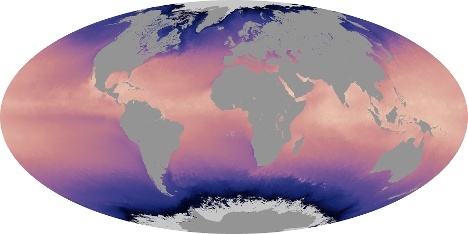 Where is the Gulf Stream warmth in the radiative flux? Where is the difference between the cold water off of Chile and the warm water off of Argentina? How about the warm vs cold waters around Australia? These are one month averages. The air is only 50 miles thick, and continents are thousands of miles wide. There are many opportunities here for vertical mixing (heck, even a thunderstorm can move air at a few thousand feet per minute vertically) so it is not sufficient to say that at high altitude things are well mixed but at the ground they are not. Further, the “Global Warming” thesis rests on radiative processes. These do not need mixing over month long intervals. The thesis is all about hot surface radiating to hot “greenhouse gases” that then promptly re-radiate back to the surface. That ought to reflect in an outgoing fraction of radiation as well, and ought to happen in minutes, not months. There seems to be a high decoupling of net radiative flux from ANY variations of surface temperatures (anomalies) and from ANY variation of the dominant “greenhouse gas” of water vapor. The net flux is reflective of the seasonal variation of insolation with latitude and NOT of the surfaces under it. There is substantially no connection visible between surfaces and any net radiative flux, so how can there be one with “downwelling” flux that is supposed to originate from the same molecules symmetrically? The one place where land form does show up is the Sahara, where things are shown as having lower net radiative flux rather than increased, from that hotter location. At any one time, there are several hundred Watts per square meter of difference of net flux between equatorial regions and polar regions. The surface temperatures are 45 C to 70 C different ON AVERAGE over the month between polar and equatorial zones. That is one heck of a lot of difference in the Stefan-Boltzmanm 4th power of temperature radiative function. 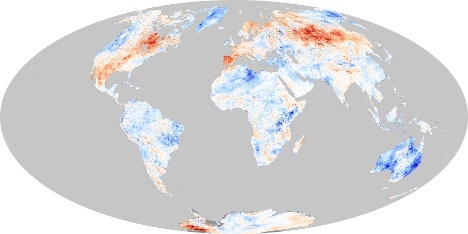 Our net energy flux is strongly dominated by the warm equatorial zone where we have seen the least warming signature. Where we have ‘anomaly warming’ is where we have net energy loss to the tune of over 100 W/M^2 (as I read the chart). How can “downwelling radiation” cause that ‘anomalous warming’ when the radiation is largely in deficit and where the absolute temperatures are quite low? What I see in these graphs is pretty simple. The actual surface temperatures are in rough equilibrium with the actual solar input power. Over land, the heat storage is lower so the averaging interval is closer to weeks or months and reflects seasonal changes more strongly. The oceans have little to no evidence of that seasonal swing and look to average their solar flux over a period of longer than a year (given the location of the ‘cold band’ more or less symmetrically despite this being a November month). Water vapor follows the ocean heating, it does not cause added heating nor change the net flux levels. The net radiative flux most strongly reflects the net inbound solar flux with seasonal variation, with a minor influence from land / water surfaces mostly visible in the Sahara (under substantially clear sky and highly reflective sand). Heat-in becomes Flux-Out in less than a year, and closer to the monthly average reflected here. ( I’d baldly assert it is down in the daily range, if we were to look at daily graphs, based only on the fact that it gets cold at night and hotter during the day… an existence proof of rapid flux cycling, IMHO). I can see no evidence of any heating from “downwelling radiation” and I can see no evidence that areas with a warm anomaly got it from any such radiative process. All the surface temperature anomalies look to be driven by entirely unrelated processes and issues. The global energy balance is dominated by the net difference between polar and equatorial zones with substantially all inbound flux being from the hot band. That same band is where we find THE most water vapor, by far. 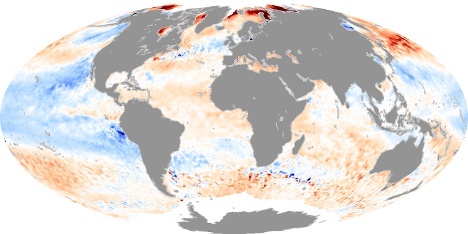 As THE most important “greenhouse gas”, it looks to be tracking ocean surface temperatures, not net flux levels. It is effect, not cause, of surface warming. It has no feedback loop with more flux causing more water vapor causing more warming. This argues strongly for the concept of water vapor as “working fluid” in a heat-pipe earth rather than insulative blanket as a “greenhouse gas”. As CO2 is much much less as a percentage of total hypothetical ‘greenhouse effect’, anything it might do is swamped by the water vapor. In short, the thesis of “downwelling radiation” causing surface temperatures to rise has no evidence in the monthly data. If it is not in the monthly data, how can an average of those months have it? Some other process is dominating, and that process looks to be convective heat transfer, radiation of that heat at polar regions, and a fairly uniform process happening over the entire planet roughly in sync with the solar flux levels and not in sync with “greenhouse gas” levels. All done with ‘eyeballing graphs’, so a giant ‘Dig Here!’ would be to do the same thing with proper math, analysis, wiggle matching, error bars, etc. This entry was posted in AGW Science and Background and tagged CO2, Global Warming, temperatures, water vapor. Bookmark the permalink. Right where the wires connect! Anyone who looks seriously into the GHE will come to similar conclusions. It’s kind of like the fact that blood-letting held a major role in medicine for a couple of thousand years or more. Hopefully, rationality will win out much sooner regarding CAGW. @R.Shearer: like the fact that blood-letting I.E-Gore effusions …and their “leech” companions…. LOL! About what I’d expect. Following solar changes with a multi-year lag. Water vapor ought to follow soon too (as all that water falls as rain…) and that, then, ought to let land anomalies (real ones, not the ‘adjusted’ ones from badly sited thermometers…) drift to ever lower levels. I notice from this site that the “anomaly” in your data is about to be “fixed”. We know nothing!…or rather we have chosen to know nothing! (*)Note about St.Newton´s holy gravity: He felt the small apple falling but he FORGOT the tree it was falling from, and it goes up not down! I am very impressed by the observations you have done here. If you could explain “working fluid in a heat-pipe”, that would be great. I hope that your observations are passed to a high-level climatologist – and perhaps several people representing different kinds of commitment to the ruling paradigm that is being used to explain climate functioning. It would be very interesting to see what they have to say and if there is unanimity or significant variation in their responses. You are talking about changing the explanatory system of assumptions at a fundamental level, based on evidence. How will they respond? Shows where earth got wetter (more water) and where it got drier. A heat pipe is a pipe (often lined with something like cloth) and with something like water or other fluid in it. When one end is heated, the fluid boils and moves the cold end where it condenses. That liberates the ‘heat of vaporization’ and the water then flows (usually via capillary attraction) to the other, hot end; where the whole process repeats. The water is the ‘working fluid’. They can also be made without the cloth and with gravity having the condensed fluid fall. This is done on the Alaska Pipeline to keep the permafrost frozen. On a giant scale, we see the same thing happening with the earth as water evaporates, rises, then falls as rain. Ah, yes, the data diddlers and their “fix”… Can we say “The Fix is IN”? Nice point about the Apple. Yes, I’ve generally avoided going into the point that there are GigaWatts of electrical things going on when water droplets rise and fall. The amount of lightning in places like Florida is astounding. Add in the high altitude sprites and elves and all… it’s a very electrical process. Unfortunately, I’m not good enough at meshing it all yet to be able to put that in a posting with the temperature stuff and not have it just be one big complicated mess with little illustration value… So I usually put electrical stuff on one posting and temperature stuff in another (though I have noted the connection between electrical stuff and where we have ozone at the poles… Where, BTW, I expect a reversal of the ‘typical’ S.H. ozone hole and a persistent N.H. ozone hole as we reestablish solar activity in a new regime… but that will likely be after the present minimum ends. During the minimum I expect ozone holes to be small and sporadic). Interesting part is they mention Australia but make no mention of the increase in “water” in Greenland which would be ice. Can’t seem to get it out of my mind that in a larger sense weather and climate have a lot more to do with the celestial physics of the Old Milky Way than we’ve been giving credit to. Anyone else see a trend? Ocean heat content updated to the end of 2011. It fell again. Basically flat since 2003-ish. Raining cats and dogs tonight here in cloudy California.